It's been a while since I've blogged about life at our home. We made it through the craziness of December. We had a wonderful Christmas and enjoyed spending lots of time with family. We were lucky enough to spend Christmas Eve and part of Christmas day with my grandparents. I remember so many wonderful Christmas's with them growing up I was so excited to have my kids spend Christmas with them. I took tons and tons of photos but this one is my very favorite. Isn't this a great photo? I think my grandparents are the cutest! I'm so lucky to have them! On Christmas Eve we play minute to win-it games. 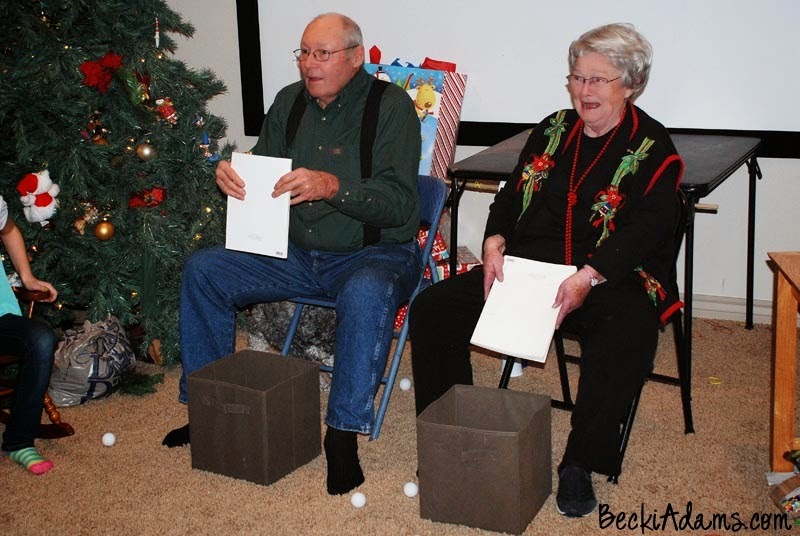 In this game Nana & Papa were trying to get ping pong balls to go into the basket by using a book as a "backboard". We had so much fun with them. I really want to emphasize to my kids that the holidays are about family and making memories, not presents. We don't focus a lot on presents. At our house we do the "something you want, something you need, something to wear, and something to read" gifts. The "something you want" gift comes from Santa and the rest come from mom and dad. When I look back on Christmas's when I was a child I don't really remember what I got but I do remember spending time with grandparents, cousins, and aunts and uncles. Hopefully, that is how my kids will remember their Christmases as well. We've settled into the quiet of January. (Well, as quiet as things get with 3 kids.) We all got lots and lots of books for Christmas so we've been doing lots of reading. My girlie has been reading some classics as well as some new books. She got a kindle for Christmas so she's taking advantage of the free classics. She's loving Little Women and the new Diary of a Wimpy Kid book. My little man is reading lots of Little Critter books and lots of the Berenstain Bears books. My oldest is reading Brian's Winter it's a sequel to Hatchet . I loved that book growing up! I'm not sure what my hubby is reading. He loves to reread books. I think he's probably reading a western novel or something by Clive Cussler . I should probably pay a little more attention to what he's reading so I can get books for him sometime, I'll work on that. I've read a TON in the last few weeks. I've been loving anything by Sarah Jio . I got hooked on her books when I read Goodnight June (this quickly became one of my all time favorite books). It's a fun easy read. I've also read: The Rosie Effect and The Storied Life of A. J. Fikry . I loved both of them. I've already loaned them out to friends. I've read a lot of great books lately. Have you read anything good lately? I'm always up for a good book. Amazon Prime is my favorite...but it may be a little too convenient. My collection of books is already out of control. As for my health, I would like to say that I've found the right treatment and that I feel great all the time. That's not how things are going though. I've tried a few treatments without success. I started a new one this week. I'm crossing my fingers that this will be the medication that my body needs. I'm doing my best to keep up with the kids and all their activities. I do pretty well most of the time. Of course, I have good days and bad days. Last night as I crawled into bed frustrated and exhausted because I knew I hadn't accomplished nearly what I needed to get crossed off my to-do list. My little man crawled into bed next to me and kissed me on the cheek and snuggled in right next to me. He put his arm around me and just laid there. The thought crossed my mind that I needed to quit feeling sorry for myself and that I had so many things that so many others long for. I have a beautiful home, three beautiful kids, the best husband I could ever ask for that takes such great care of me and the kids. I've got a job that I love and family close by to help and support us. I really shouldn't be whining about not crossing a few items off of my to do list. Looking forward, I'm still trying to keep up, be grateful for what I have, and just keep trying! 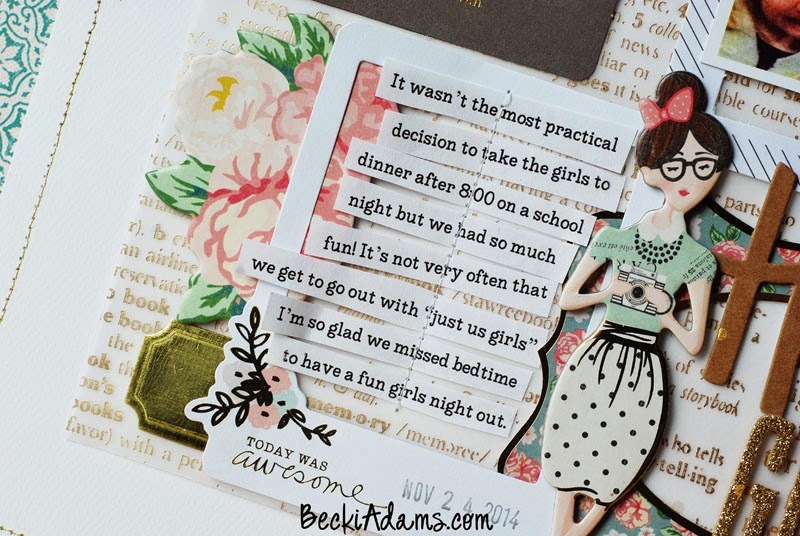 I've also been doing a LOT of scrapbooking and paper crafting project. I thought I'd share one of my recent favorites with you. 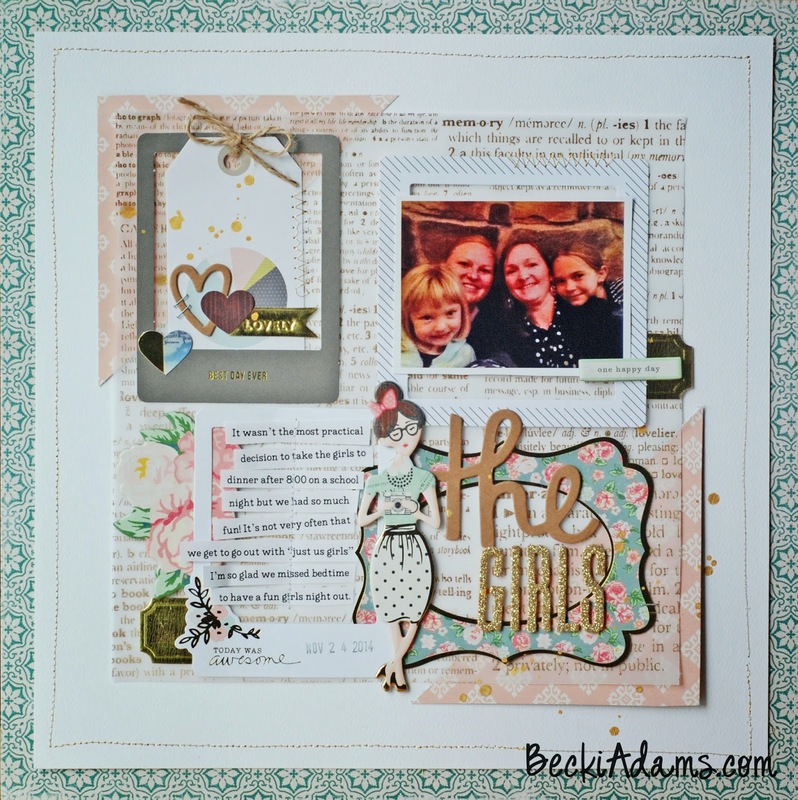 I created this using bits and pieces of the Open Book collection and some bits and pieces from Gossamer Blue. This is such a low quality photo but I love it and I had a story to tell about it. I love how these two collections came together. I stitched along the edge of my layout and a few places throughout with gold thread. I LOVE how it looks. I haven't added ink splatters to one of my projects for a while, I don't know why but I remember how much I love the look of it. 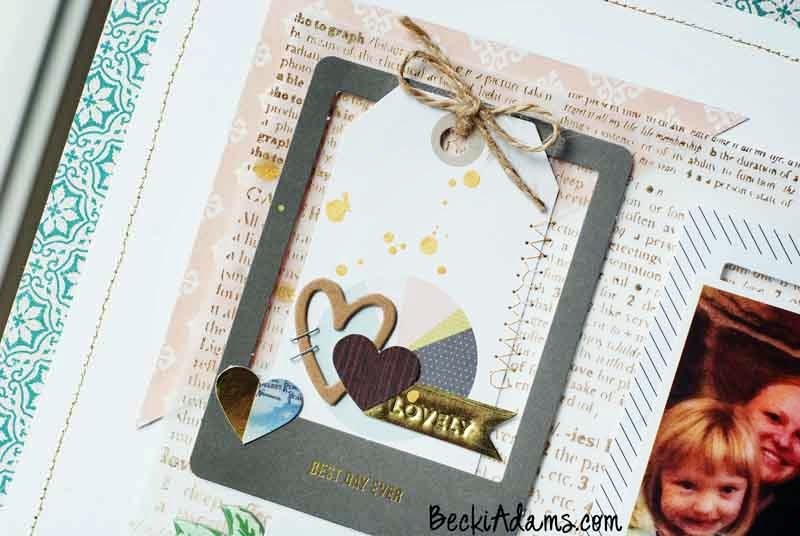 My favorite gold spray ink is Heidi Swapp's Gold Lame. It's the only bottle of ink that I'm even close to running out of. I tried a different method for attaching my journaling strips and just stitched them right down the center. I like how it turned out. I have a lot more fun projects hiding up my sleeve. I can't wait to share them with you. Thanks for hanging out with me today and sharing a little bit of life at our home. Family times are so precious. 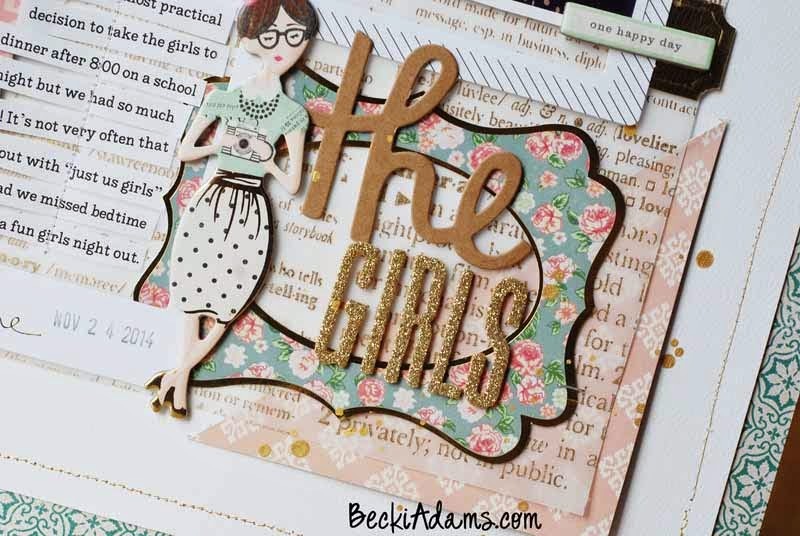 Great layout and cards, thanks for the inspiration Becki! Family is everything! Thank you for your sweet comments, Jenny! I think this photo is priceless too. I can't wait to get it in my scrapbooks. <3 Thanks, Cara! LOL, I doubt it, Mendi! You're so sweet!